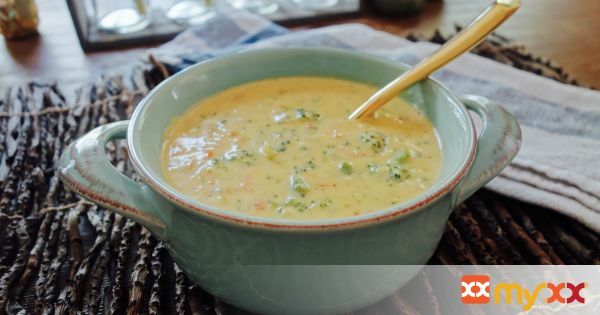 A creamy, delicious broccoli and cheese soup! 1. Saute the onion in 1 tablespoon melted butter and set aside. In a large pot whisk together the melted butter and flour over medium heat for about 3-4 minutes. 2. Slowly whisk in the half and half and stock. Let it simmer for about 20 minutes. 3. Add the broccoli, carrots, and onions. Let them simmer on medium low for about 25 minutes until the broccoli and carrots are tender. 4. Add nutmeg, salt and pepper and sharp cheddar cheese. Let the cheese melt and then serve. For a smoother soup puree it in a blender... but I love the chunks!